Preheat oven to 400. Add 1 Tbsp. olive oil to cast iron skillet and heat over medium-low flame. Toss sprouts with 1 Tbsp. olive oil, salt and pepper and add to hot skillet. Place skillet in oven and roast for 30 minutes, stirring every ten minutes, until slightly crispy. Meanwhile, as the sprouts are roasting, start heating pasta water and add remaining olive oil to an extra large skillet. Heat oil over medium flame and add sliced sausage. Brown sausage on each side. Cook pasta al dente according to package instructions. Reserve 1/4 cup pasta cooking water and drain pasta. 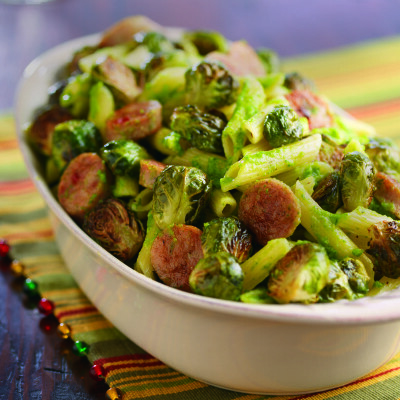 Add pasta, cooking water, roasted sprouts, and pesto to sausage pan and sauté over low flame for 2-3 minutes to finish cooking. Serve with parmesan cheese on the side.